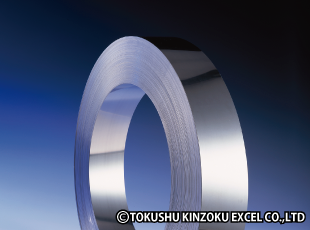 Quenched Stainless Steel (SUS420J2, RB-S) | TOKUSHU KINZOKU EXCEL CO.,LTD. SUS420J2 and RB-S are classified as martensitic stainless steels. Like carbon steels, few stainless steels harden when heat treated—such materials are limited to precipitation hardening stainless steels and medium- to high-carbon chromium stainless steels. Although martensitic stainless steels are stainless steels, they have a high percentage content of carbon and, like carbon steels, can be made very hard through quenching and tempering. 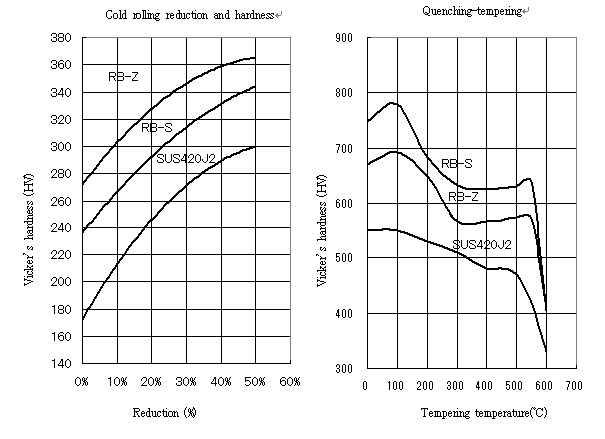 Most customers who quench SUS420J2 and RB-S perform heat treatment after each product has been formed. However, in recent years, advances in processing facilities and technologies aimed at streamlining the production process have made it possible to manufacture efficient products with little variation through the use of continuous presses, cutting, and other methods, even when processing extremely hard materials such as hard-finished steel strips and quenched steel strips. Due to the complex nature of quality control and work management associated with heat treating products after processing, and the fact that productivity is low, there is an increasing trend toward using pre-quenched steel strips instead of quenching products after forming. To meet customer requests for the unique properties and hardness of stainless steel, and high quality, we supply quenched stainless steel strips. *Quenching work is performed at our Shanghai factory. SUS420J2 and RB-S grades are ideal stainless steels for applications that require wear resistance. They have high tempering resistance and can also be used for applications that require heat resistance. Due to the effects of structural transformation, SUS420J2 and RB-S have low mechanical and physical directional properties compared to austenitic spring steels hardened by rolling. As SUS420J2 and RB-S are martensitic stainless steels, they have a higher Young's modulus than nonferrous and austenitic spring metals, making it possible to reduce the thickness and width of flat springs. Our original quenching method ensures wide materials with excellent flatness. We can manufacture materials with more-precise thickness tolerances that regular JIS products and competitors products cannot match. Introducing non-quenched martensitic stainless steels. Introducing stainless steel materials for blades. We offer a range of high-quality materials for use with blades such as carbon steel.